This English Bulldog Wind Spinners is adorable! Great gift for the Bulldog lover. Their small size and price are an easy fit for any garden and any pocketbook. The Petite Spinners come in a compact package and are simple to assemble and display. 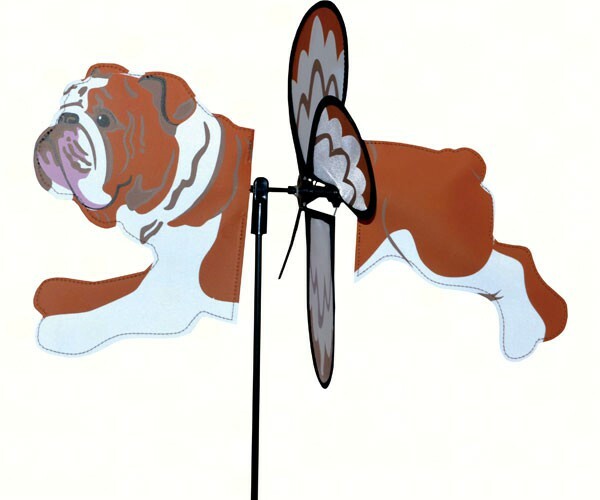 This wind spinners come with a fiberglass pole and ground stake.This bulldog wind spinner turns and spins in the wind. The wings are preglued so you won't be picking up pieces after a big wind. Made from durable polyester rip-stop.